5 Beds 5 Baths 3,574 Sq. 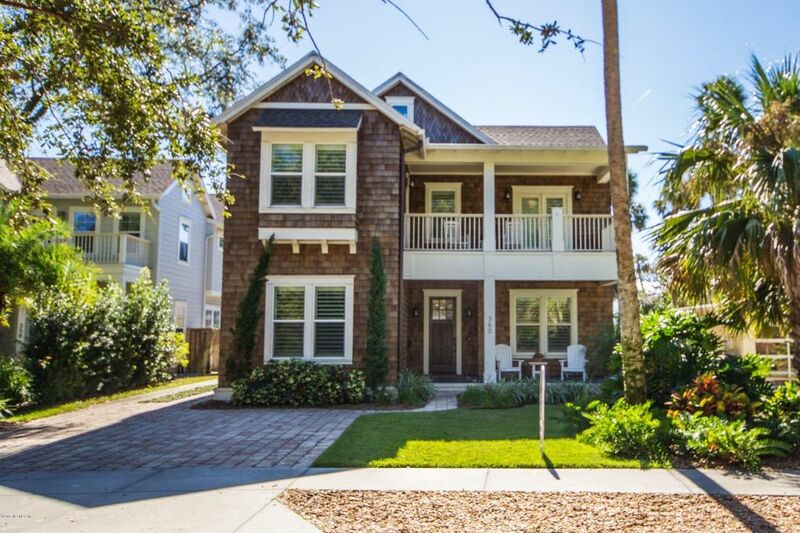 ft.
Atlantic Beach Chic | Tucked away within a quiet beach neighborhood lined by large tropical palms and majestic southern oaks, fragrant sea breezes and steps to the pristine sands of the Atlantic Ocean sits this chic coastal home. A cedar shake exterior, beautifully landscaped paver drive, detached two-car garage, brick-lined covered front porch and 8-foot Mahogany door set the stage for the relaxed luxury inside. This meticulously constructed seaside oasis is like walking into the pages of a designer magazine. The attention to detail is at the forefront of this well-appointed custom home, from the coiffured ceilings and custom cabinetry on the first level to the dramatic 15-foot cathedral ceilings in three of the four en-suite bedrooms on the second level., A white shiplap entry and wide planked oak flooring lead to an entertainment area designed for the relaxed elegance of the Atlantic Beach lifestyle. Grill at the gourmet summer kitchen while listening to music or watching TV. Hop out of the water to snack on blueberries from bushes that wrap the dazzling pool, or relax on the second story balcony with a good book and ocean breezes. The bright kitchen (equipped with Thermador appliances), fully wired family room, spacious dining room, separate bedroom (or office), full bath and expansive covered outdoor living area, comprise the first level. A wood plank staircase equipped with built-in LED lights guides the way to second level landing, the master retreat, four en-suite bedrooms and a well-designed laundry room. Just a short walk directly down the street to the beach or a leisurely stroll to the restaurants, boutiques and entertainment of the pedestrian-friendly Town Center. This property is best described as a peaceful sanctuary that perfectly blurs the lines between chic interior spaces and the refreshing outdoors in an idyllic location.